Manav Vikas Sanstha (MVS) is a society, registered under Societies Registration Act by the Govt. of Rajasthan in the year 2000 and an NGO of NITI AAYOG, Govt. of India. It aims at making people employable through various activities including skill development. During PMKVY 1.0, MVS conducted largest numbers of RPL training across all sectors in the country. MVS is an Approved Training Partner of National Skill Development Corporation (NSDC). MVS has been conducting trainings funded by various government agencies including National Backward Clas ses Finance & Development Corporation (NBCFDC),National Scheduled Caste Finance & Development Corporation (NSFDC),National Safai Karamcharis Finance & Development Corporation (NSKFDC). 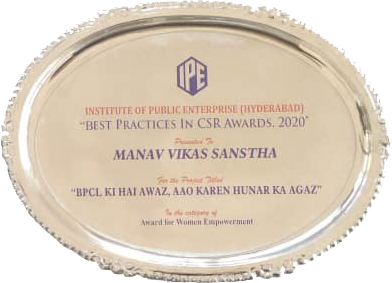 “Manav Vikas Sanstha”, is an ISO 9001:2015 (QMS) certified organization. MVS has recently conducted trainings with CSR funding by Indian Oil Corporation Limited, Container Corporation of India (CONCOR),Indian Potash Limited and Haryana State Industrial & Infrastructure Development Corporation (HSIIDC).MVS has been mandated for Cluster Development of Handloom & Handicrafts for artisans belonging to SC categories across the country,which is funded by the Ministry of Textiles, Government of India under DC (Handlooms) & DC (Handicrafts) schemes. Clusters development includes establishment of Common Facility Centres and Training & Design Centres for skill development and backward & forward integration. MVS has been associated with various State Skill Missions e.g. Andhra Pradesh, Assam, Haryana, Himachal Pradesh, Maharastra, Uttarakhand and many others in pipeline. “Manav Vikas Sanstha”, is a Jaipur based NGO working in the field of Skill Development, education and other sectors since 2000. We are affiliated with various Sector Skill Councils (SSCs) & State Skill Missions. MVS has successfully carried out trainings under PMKVY/CSR/NBCFDC/NSKFDC. Also, we have entered into an MoU with NSFDC for setting up clusters pan India in Handloom & Handicraft sectors which includes skill trainings too. • MVS is associated with NSKFDC and has been allotted targets in Uttarakhand and Himachal Pradesh. • MVS has forayed into CSR projects and is implementing in U.P. and about to start the projects in many other states. • We have services that are meant for skill development projects PAN India, as well as we have several schemes/policies/grants offered by Government of India & other agencies, to be implemented for the promotion of skill development and employment promotion. • There are several state government projects, which are being implemented jointly with Manav Vikas Sanstha. • Manav Vikas Sanstha is pioneer in conducting skill trainings for nomadic tribes in the country. •Our focus is on conducting trainings for unemployed youth and weaker sections of the society especially, minorities, SC/ST, OBC, nomadic tribes, manual scavengers & safai karmacharis in order to provide them a gainful employment either through wage employment or self employment. We have been able to facilitate employment to more than 75% of our past trainees. MVS is managed by a team of professionals who have earlier worked with various corporates, government & non-government organizations and now have dedicated their careers to making a difference for the weaker sections of the society. MVS was conceived in the year 2000 and is a registered society with the Government of Rajasthan vide Registration No. 293/ Jaipur/ 2000-2001. Upliftment of the Weaker Sections of the Society including Minorities. Supporting the Independence of the 'Vulnerable', by empowering them in skills of their choice through high impact programmes. We foresee, plan and execute our aim & goals using the best possible course of action under the prevailing circumstances. We identify goals using lateral thinking and make an honest effort to fulfill our goals by simultaneous high impact programs. We look forward to assistance from individuals, groups, organizations, Central government and states to pursue and follow up our actions to the desired results. We provide opportunity to every genuine seeker to learn the skills of his/her choice, mostly free of cost to the individual and sometimes, stipend/scholarship is also given. We provide infrastructure, facilities, tools, trainers & knowledge to the aspiring minds. We have the detailed know how, techniques, programmes, schemes & allied offers presented by the Central and State governments from time to time offered for the welfare of the target audience & never let by go a presented window of opportunity. We stay focused on our 'Aim', 'Mission' & Values'. We make mid course correction as required by the people, Central and State governments to keep on course with the desired end results. Our people, partners, centers, groups, organizations, allied NGOs are open to discussions at all stages for the most favored & desired course of action. Our core competencies & values help us to achieve our results.